Schandmaul is a German medieval folk rock band from the vicinity of Munich. 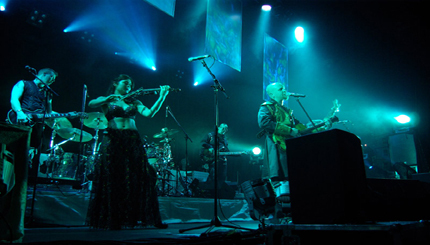 As well as using modern instruments like the bass or e-guitar, the band utilizes instruments typically used in Medieval folk songs, such as the bagpipes, hurdy-gurdy or shawm, to produce their trademark folk rock sound. The name 'Schandmaul' translates roughly to 'malicious tongue' and refers to their mascot of a grinning skeletal jester.